Bulk material handling is an engineering field that is centered on the design of equipment used for the handling of dry materials such as ores, coal, cereals, wood chips, sand, gravel and stone in loose bulk form. It can also relate to the handling of mixed wastes. Bulk material handling systems are typically composed of stationary machinery such as conveyor belts, screw conveyors, tubular drag conveyors, moving floors, toploaders, stackers, reclaimers, bucket elevators, truck dumpers, railcar dumpers or wagon tipplers, shiploaders, hoppers and diverters and various mobile equipment such as loaders, mobile hopper loaders / unloaders, various shuttles, combined with storage facilities such as stockyards, storage silos or stockpiles. Advanced bulk material handling systems feature integrated bulk storage, conveying, and discharge. 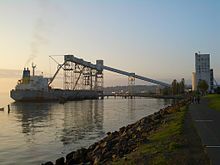 The purpose of a bulk material handling facility may be to transport material from one of several locations (i.e. a source) to an ultimate destination or to process material such as ore in concentrating and smelting or handling materials for manufacturing such as logs, wood chips and sawdust at sawmills and paper mills. Other industries using bulk materials handling include flour mills and coal-fired utility boilers. Providing storage and inventory control and possibly material blending is usually part of a bulk material handling system. Non-bulk materials handling classifications include palletization and containerization.